Alex and Jeremy Dostie can rattle off all the firsts at their two-month-old business, Dostie Bros. Frame Shop & Gallery: First person on the doorstep the morning they opened? “Mad scientist” clay sculptor John Brickels. First paying customer? Painter Michael Smith, followed by artist Clark Derbes. First to place an order? Black Horse Fine Art Supply’s John Bates. 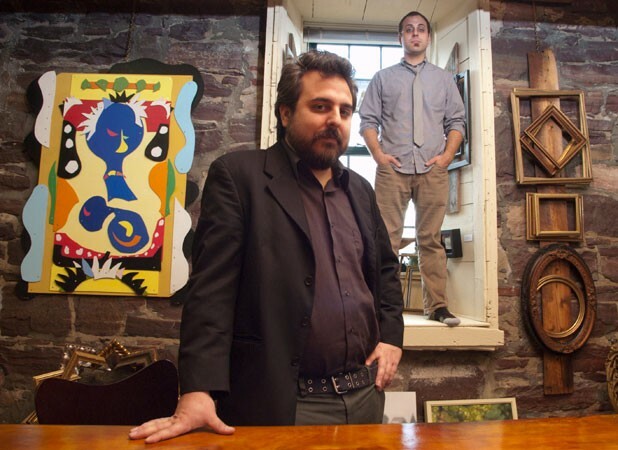 The Dostie brothers are devoted to the Burlington art scene, especially in the newly designated South End Arts District. Alex and Jeremy Dostie credit their artist friends with getting their business off the ground, and they hope to return the favor — by selling those friends’ artwork. It was no coincidence that the brothers opened their doors in early September, just a week before the South End Art Hop. They began their lease on the Kilburn & Gates Building location six weeks before the annual art event and hustled to set up shop so they could welcome visitors that weekend. “Imagine 50,000 people on your doorstep the week after you open,” says Alex. The 650-square-foot space, which is divided by windows into a gallery/retail area and a framing workshop, is crammed with ornate vintage frames and a rainbow of frame samples hanging from reclaimed barn board. Still, Alex, 36, and Jeremy, 34, manage to fit a fair number of artworks on the stone walls. “We squeeze ’em in where we can,” says Alex. This month, they’re showing the pop-art-style work of Burlington painters Mr. Masterpiece and Michael Smith. Exhibitions will rotate monthly, but visitors will always find a few pieces of Alex Dostie’s, as well as work by Kristen L’Espérance, Brooke Monte and Adrian Tans. Alex says he’s a huge fan of all three but has a special connection with Monte and Tans: He’s on the VermontSnows.com Snow Sculpting Team with them. A deep windowsill is covered with smaller paintings, various oddities, a Keurig coffee machine and wooden bird decoys by Rob Root, a local butcher who moonlights as a bass player and vocalist for the Decoys. Alex and Jeremy are proud Colchester natives. Alex went to Rice Memorial High School, Jeremy to Colchester; both graduated from the University of Vermont. They were born on the same day two years apart, a fact that still seems to delight them more than three decades later. Physically, the Dosties are variations on a swarthy theme. When they opened the business a couple months ago, they both had full, dark beards. These days, all that remains of Jeremy’s is a soul patch. Before the brothers teamed up, Jeremy worked for several years as a consultant analyzing flood-hazard zones in central Vermont, woodworking on his own time. As he began looking for a career change, his older brother, an experienced framer, was hoping to start his own business. “I was excited about the possibility of getting out from behind a computer,” says Jeremy. He wanted to work with his hands, to create something. Alex, an artist himself, has been a key player in the Burlington arts scene for more than 10 years. He’s currently manager of the Box Art Studio on Pine Street and serves as board president of Art’s Alive and on Green Candle Theatre Company’s board of directors. “I’ve curated a lot of exhibits in this town,” he says. Plus, Jeremy keeps his older brother on track. “Left to my own devices, I will just talk and schmooze,” admits Alex.